Medical cannabis legislation was approved by Pennsylvania’s House of Representatives last week and will now move on to the Senate. The legislation was introduced by State Rep. Jim Cox (R-Berks/Lancaster) in 2014 and its primary sponsor is Senator Mike Folmer. “This vote is a victory for children suffering due to seizures, senior citizens diagnosed with cancer and other patients in Pennsylvania who could benefit from medical cannabis. 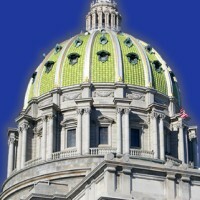 It is time for Pennsylvania state government to stop standing between patients and the medical cannabis their doctors feel could help them,” said a very pleased Rep. Cox. The legislation seeks to establish a medical marijuana program, a related tax, clinical research centers and associated mechanisms. Under the program, seventeen conditions would be eligible, including severe chronic or intractable pain of neuropathic origin where conventional therapeutic intervention and opiate therapy is contraindicated or ineffective. Medical marijuana will be administered in either pill, oil, topical, vaporization or nebulization, tincture or liquid forms – smoking medical cannabis or its use in edibles will not be permitted. Each patient or caregiver will be able to possess up to a 30-day supply of individual doses. Should the legislation get the nod from the Senate, up to 25 growers and processors will be granted a license; along with up to 50 dispensaries – each of which will be able to dispense medical cannabis from three locations. Something that may have helped the vote along was Rep. Jeff Pyle’s impassioned speech prior to voting. Mr. Pyle spoke of his own battle with cancer and pleaded for other representatives to vote in favour. While medical cannabis has come up against some resistance in the state, it enjoys wide support; including the written backing of more than 50 clergy members from various faiths. On a related note, in October last year a bill to allow the cultivation of industrial hemp in Pennsylvania was unanimously supported by the state’s Senate Agriculture & Rural Affairs Committee. Previous articleCould Medical Cannabis Cure PTSD?